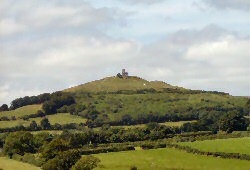 Rising to a height of 1,100 ft (335m) Brentor with its church is a prominent landmark over west Devon. The rock itself is the remains of a mass of lava deposited on the seabed of a shallow sea which covered this area some 300 million years ago. The softer rocks formed from sand and mud around this lava flow has eroded leaving Brentor standing proud above the landscape and visible for miles around. From its summit you can see one of the finest views in Devon, overlooking Dartmoor, Exmoor and Plymouth Sound in Devon, together with Bodmin Moor, Kit Hill and much of east Cornwall. The name Brentor may be derived from the Anglo-Saxon ‘brene’ meaning to burn (perhaps relating to beacons being lit on its summit) or the Celtic ‘bryn’, meaning hill or mount. The church of St. Michael de Rupe (of the rock) on the summit is the most obvious sign of human building. However long before that, human hands had used Brentor's prominent position as a defensive site with an Iron Age earthwork being built here in approximately 500BC. The remains of which can be seen around the eastern side of the tor with its numerous grass-covered lumps and bumps, an earthen bank (once a massive defensive rampart) and the remains of a strong entrance. To the south-west of the tor there are the remains of a 19th century maganese mine which operated from 1815 to 1856. St. Michael de Rupe was built around 1130 by Robert Giffard, the lord of the manor of Lamerton and Whitchurch. The church was re-built at the end of the 13th century and the tower added in the 1400s. It is the fourth smallest complete parish church in England measuring 37ft long and 14ft 6in wide. Although the church of St. Michael is the parish church of Brentor there is, in the nearby village of Northern Brentor, the church of Christ Church. This is what is known as a chapel of ease for St. Michael as its position on Brentor does cause problems of access for services especially when the weather is poor or for burials, as the soil on Brentor is thin. The church underwent a major restoration in 1890, with even the roof being replaced. The font is the only furnishing of the church that dates from before the restoration of 1890. There is a stone sundial on the south side of the tower; the name Walter Batten is at the foot of the dial, which is dated 1694.